Way to fire up an appetite! 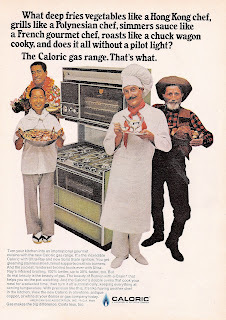 Giving the lie to that adage about too many cooks in the kitchen, this 1967 ad touts the performance of the range by highlighting its different technologies. It's interesting to note the inclusion of an infrared broiler, a feature that was rather ahead of its time. Reports on a revival of the Caloric brand have been circulating for a few months, now, with products promised to appear sometime in the fall.